I’ve taught online classes for many years. Every semester, in every class, I receive at least one panicked email. The topic is always the same: “Help! I’m not good with computers and I’m afraid I won’t do well in this class!” Don’t worry: you’re among friends, and we will help you transition from tech-averse to tech-empowered. Digital Content Creation, Curation and Promotion (affectionately referred to as DC3P), co-taught with Dr. Constantinos Coursaris, covers content creation for a wide range of digital media. This includes social media (e.g., Facebook, Twitter, YouTube), interactive media, and visuals (e.g., websites, images). Students learn how to create targeted content with software such as Photoshop and Illustrator, and apply it in real-world scenarios. (The logo creation project is particularly fun, if I do say so myself!) This range of topics is a “sampler” to help students understand the scope of digital content creation, in a way that proves helpful to their careers as communicators. In addition to the professional skills it provides, this type of digital skill-building helps students gain technological confidence. Even with technological confidence, some students worry that the online format of the class will leave them feeling detached from their instructors and classmates. This is understandable, but we have powerful tools to fight isolation: we’re all pretty darned interesting, and technology makes it very easy to share our interests and personalities with one another. To help students get to know me, I make an introductory video. Students can see what I look like, hear me speak, and learn a little about my personality. This type of technological introduction can’t replace in-person interaction, but it can dissolve some of the "am-I-talking-to-a-person-or-an-A.-I.?" feeling. Dr. Coursaris and I encourage students to make a similar introduction video. What are your interests and hobbies? What do you hope to learn in this class? Do you have pets? Any fun quirks you would like to share? 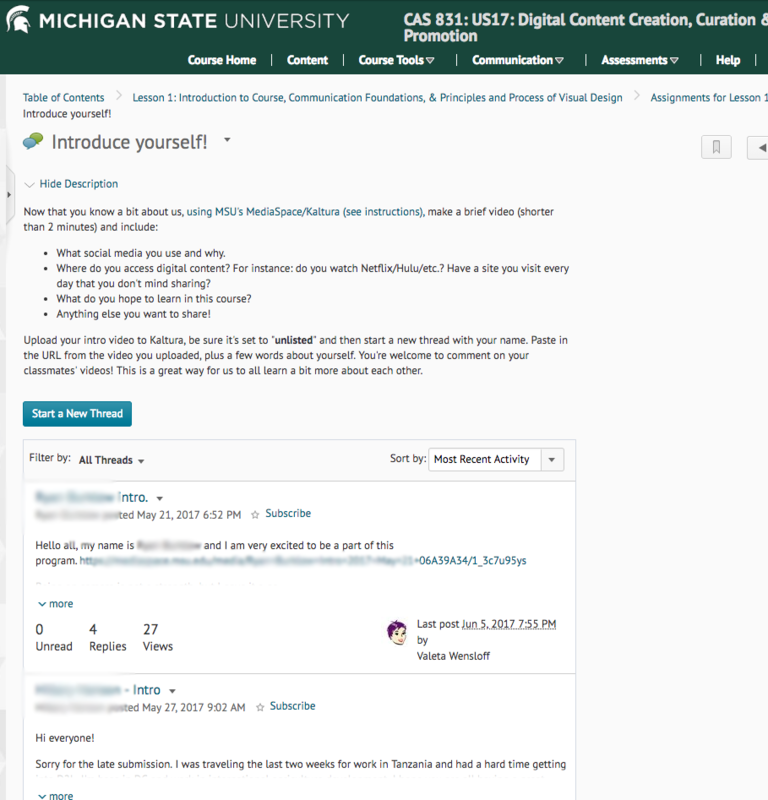 I’ve seen several friendships start by someone saying, “Oh, I like That Thing, too!” After posting introductory videos, students continue to get to know each other on the class discussion board. DC3P students have a tendency to use animated GIFs and have lots of fun, off-topic conversations. Getting to know each other socially helps students feel more comfortable with the online class format, more eager to share their own experiences with the course content, and more likely to bounce ideas off each other--which is especially helpful for writer’s block (or Photoshop block!). Despite the virtual format of the class, it is easy to build a friendly, connected community just by being ourselves. I am familiar with college anxiety--I still occasionally have nightmares that I forgot my schedule, started picking classes late, went to the wrong classroom, forgot there was a test... you know what I mean! I realize that many of our students feel nervous about starting a new college program, but I can reassure them that their instructors and classmates will make sure their experiences in the Strategic Communication MA program never feel like those bad dreams. The online student community can be a very good resource to reduce academic worries. Students can post questions (even if they are afraid it is a "dumb" question) and learn that it's completely normal to feel befuddled when one is learning new things. Some students may have more experience in a given topic, and be able to teach their classmates something new. In addition to being a friendly place to help with academic questions, members of the student community can enhance each others' professional skills. A student might share a class-related challenge in their work life, and other students can chime in with potential solutions. Sometimes, students will share how they are already applying classroom knowledge to their daily work life--perhaps analyzing their social media post engagement, or sorting a color scheme for a project. This is what I love the most about being an instructor: knowing that my students are using what they learned, both from their instructors and their classmates, in important and innovative ways. In the end, the fact that we are not all physically together doesn't stop us from learning a lot and having a fun time doing it. Community-building in virtual spaces can be just as fun, reassuring, and helpful as an in-person experience. And since our virtual communities include animated GIFs... they might even better than in-person! Valeta Wensloff received her MA from the very department for which she now works. She is Undergraduate Director of the Department of Media & Information and assists with course production in the Strategic Communication Online Master's Program. In her off time, she likes making costumes and tiny creatures out of clay.